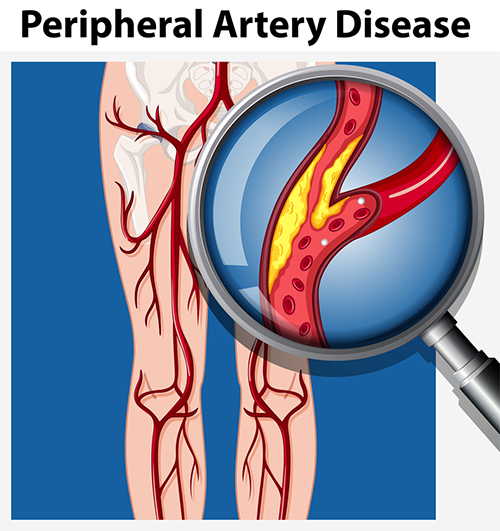 For the convenience of naming, Peripheral Arterial Disease refers to narrowing or blockages in the arteries that supply vital organs and limbs outside of the heart and brain. Often when your doctor mentions PAD, it refers to arterial disease in the lower limbs. However, PAD is often seen alongside arterial disease involving the heart and brain. In-addition it is also important to stop smoking as there is evidence that quitting smoking reduces progression of PAD. Healthy diet, weight reduction and regular exercise will also help improve the longterm outcome from PAD. To treat intermittent claudication, initially your doctor will ensure that you are medically optimised and the risk factors for PAD are addressed. This will typically include starting a blood thinner such as Aspirin and also a cholesterol lowering agent called statin. Statin is often prescribed as it has been shown by research to improve the function of the inner cell lining of the blood vessel wall. Although these medications will not improve the distance you can walk without claudication pain, it has been shown to reduce the incidence of heart attacks and strokes in the future. Invasive treatment is not generally recommended or required for patients with claudication. It may be necessary only if you do not respond to conservative treatment and the claudication symptoms are severely interfering with your daily activities and quality of life. Angioplasty is a keyhole procedure (endovascular surgery) that opens up narrowed and blocked arteries by inflating a small balloon inserted via the groin. After an angioplasty, a stent (wire mesh tube) may be placed within the artery to hold the artery open. Your surgeon may perform a bypass surgery, where a graft (healthy blood vessel removed from another part of the body) is attached to re-route blood away from the block. How does Cigarette smoking affect the arteries? Smoking has been shown to be the strongest risk factor for PAD and there is four times higher risk of developing arterial disease in a smoker compared to a non-smoker. Along with this, there is unfortunately a higher risk of amputations and deaths in smokers. Smoking can cause inflammation of the cells lining the inside of the artery wall and this can in turn lead to plaque formation within the wall. As the plaque build-up continues, the artery can become narrowed or completely blocked. This can affect the blood supply to vital organs downstream. There is a lot of evidence from research that shows that the benefits from quitting become evident within 2-5 years after smoking cessation. Smoking and nicotine is addictive and so quitting is not always easy and simple. A lot of research has been done looking into ways of improving the chances of quitting. The conclusion from all these large research trials is that Nicotine replacement therapy using gums, patches, nasal spray, inhalers and lozenges all help improve your chances of quitting. Please discuss with your specialist or your doctor who will be able to help you with this. Hyperlipidaemia is a medical term that refers to abnormally high levels of fats, such as triglycerides or cholesterol in the blood. It is generally seen in overweight people who are on an unhealthy diet consisting mainly of foods rich in fat such as eggs, cheese and meat. It can also be seen in people who drink too much alcohol. The fat from these food items combines with proteins in the blood to form lipoproteins. These lipoproteins are classified into two types, namely, HDL/High density lipoproteins and LDL/Low density lipoproteins. The HDL lipoprotein is often referred to as “good cholesterol”, as it prevents narrowing and blockages of the arteries. On the contrary, LDL or the “bad cholesterol” tends to deposit along the walls of the arteries, leading to a condition called atherosclerosis or hardening of the arteries. Atherosclerosis increases your risk for heart attack and stroke. Hyperlipidaemia does not cause any symptoms and is often diagnosed during routine screenings or annual health examination. If your doctor suspects that you are at risk of having a heart attack or stroke, a blood test will be ordered to determine your lipid levels. Treatment for hyperlipidaemia includes lifestyle changes such as making healthy diet choices, following a regular exercise routine, avoiding fatty foods, quitting smoking, limiting alcohol and losing excess weight. If conservative treatment measures do not lower your LDL levels to an acceptable level, your physician may prescribe medications such as statins to help. Type 1 diabetes is an autoimmune disease, in which the insulin producing cells are mistakenly attacked by the body’s defence system; hence, decreasing the production of insulin and increasing the accumulation of blood sugar. The pancreas is situated just below the stomach and produces enzymes for the digestion of food and also the hormones insulin and glucagon for the regulation of blood glucose. The pancreas consists of a group of cells called the islets of Langerhans, which produce and store the hormone. Carbohydrates in the food we eat are broken down to form glucose, which is either used immediately by the muscles and liver as energy or stored for later use. When levels of blood sugar start rising after a meal, the islets of Langerhans secrete insulin, which transports sugar to the cells. If the pancreas fails to produce sufficient amounts of insulin or the body’s cells are insensitive to the hormone, glucose starts accumulating in the blood stream, leading to diabetes. How does it impact the human body? Stages of diabetes are decided based on blood glucose levels. If your fasting blood glucose levels are between 100 and 125 mg/dL, then you are considered to be in the pre-diabetic stage. At this stage, although the blood sugar level is high it cannot be classified as diabetes and the sugar levels can be controlled by weight loss and exercise. Fasting blood glucose levels >126 mg/dL is considered a diabetic stage and will require medications to keep your blood sugar levels under control. The development of type 2 diabetes at a young age increases the risk of complications such as arterial disease and neuropathy. Diet: Eat a consistent well-balanced diet that is high in fibre, and low in saturated fats and concentrated sweets. Meals should be taken at a regular interval and avoid long periods between meals.